Author(s): Mai, P., Hampl, J., Weise, F., Brauer, D., Singh. S., Schober, A.
Abstract: Exposure systems for in-vitro investigation of nanoparticle toxicity can be classified by their deposition principle. Stagnation flow systems have an effective exposure because the particle flow is brought into direct contact with the cells. But these systems use individual housings that necessitate a transfer from the incubator to the exposure system, which induces additional cellular stress. However, incubator systems use conventional multi-well plates (MTP) in heated housings that are completely flooded with the test atmosphere. Therefore, the dose application is limited, but the additional cell stress is avoided [1, 2]. To our knowledge, there is only one approach to combine these systems to avoid the respective disadvantages . 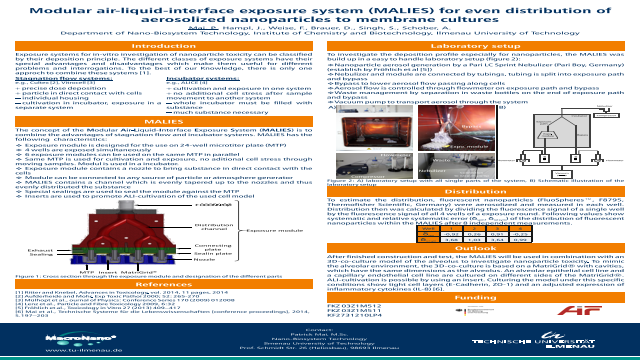 For this reason, we developed a modular air-liquid-interface exposure system (MALIES) for even distribution of aerosolized nanoparticles to membrane cultures. It uses the stagnation flow to deliver the nanoparticles and is made for use on 24-well MTPs. Here, 4 wells are exposed simultaneously. MALIES can be used inside an incubator, so cell cultures do not have to be moved. Initial investigations show a robust and even distribution of fluorescent nanoparticles. Furthermore, up to 6 of these systems can be used on one MTP to investigate different concentrations or different test-atmospheres in parallel.